The iOS version of Antutu Benchmark v7 has been released for a while. Those who have not upgraded to the new version must try it. The new iOS version will offer you a totally different benchmarking experience. After collecting benchmark results for one month, today Antutu reveals our first ranking list of the top 10 best performance iOS devices on Antutu v7. Is your device on the list? Come and check with us. 2.Period of data statistics: May 1, 2018 to May 31, 2018. 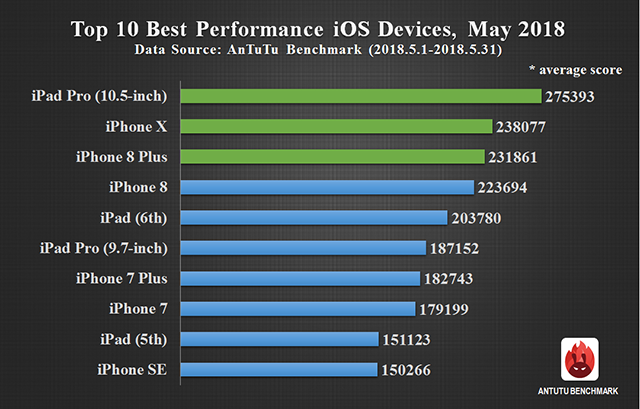 The above chart is the performance ranking list of May for iOS devices as measured by the average Antutu score, from which we can see that in general, the ranking of iOS devices is stable since there are no new iOS models announced recently. iPad Pro (10.5-inch) took the lead with an average Antutu score of 275,393 points. It is powered by A10X Fusion processor and has an 3D score of over 100, 000 points, CPU score of over 115,000 points and UX score of about 48,000 points, with the overall score outperforming the second-ranked iPhone X by about 40,000 points. With regard to iPad Pro (12.9-inch), which is also powered by A10X Fusion processor, the number of its scores reported to Antutu database didn’t reach our statistical requirement, therefore it is not present on the above list. iPhone X ranked second with an average Antutu score of 238,077 points thanks to the excellent performance of A11 processor. It has an 3D score of 95,000 points, CPU score of 86,000 points, UX score of 49,000 points. Its strong performance and the symbolic notch design make it one of the best-selling apple devices of the first half of 2018. At the third and fourth spots there are iPhone 8 Plus and iPhone 8 which scored 231,861 points and 223,694 points respectively. Like iPhone X, these two models are also powered by A11 processor. The excellent performance, plus the inherent advantages of iOS system and the promotion of third-party e-commerce platforms for iPhone 8 series make these two models the first choices for many Apple fans. At the bottom of the list is iPhone SE which gained an average Antutu score of 150266. Actually, the average scores of iPhone SE and iPhone 6 are very close. We speculate that one of the reason why iPhone SE managed to rank among the Top 10 instead of iPhone 6 is that iPhone 6 was deeply involved in the iPhone slowdown scandal. With the release of iOS 12, some older Apple devices including iPhone 5s, iPhone 6 series and iPhone SE might see a performance increase, and once iOS 12 is officially released, there will be some changes in the ranking list of iOS devices. The above data reflects the changes of the performance of iOS devices for May 2018. For more information about the ranking list, please visit Antutu official website or download AnTuTu Benchmark and check in the menu of “Ranking”.